Did Jesus tell his followers to get involved in land disputes? The Middle East conflict has Muslims (King of the South) fighting against the Western powers (King of the North and the God of Forces). Will this political struggle ever be solved? Who will win in the end? The only way we can understand is to follow Jesus' guidance when he said "So when you see standing in the holy place 'the abomination that causes desolation' spoken through the prophet Daniel -- let the reader understand -- then let those who are in Judea flee to the mountains (Matthew 24:15,16). " 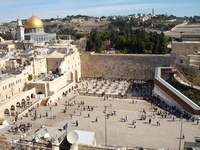 This was fulfilled in 70 AD when the Romans brought their "gods," their standards to Jerusalem. The believers fled Jerusalem and went to Pella by paying attention to, and understanding the warning Jesus gave to them. This will happen again at the "time of the end" (Daniel 11:40). Do you understand how the King of the North will "pitch his royal tents between the seas at the beautiful holy mountain (Daniel 11:45)"? "None of the wicked will understand, only the wise will understand (Daniel 12:10)." We are very near the complete fulfillment of Daniel, chapter 11! We have chronologically reached Daniel 11:43 (Libya brought into submission). Most people are unaware how quickly these events are coming, yet many sense impending doom, like the "Doomsday Preppers." After years of study, I discovered that almost no one understands the final verses of Daniel, chapter 11. Yet, if we correctly understand its "code," it clearly predicts and describes the events in the Middle East, including the Arab Spring. Please see our Free Bible Study Guides, or order our latest DVD. I will walk you step-by-step through my recent discoveries. I am not a scholar, but I bring a unique background to this subject. I’ve studied at a seminary and lived in the Middle East, studied the Arabic language and the Quran for many years. The experience of living among Muslim people opened my eyes in so many ways. Much of what you’ll read is not original. I stand on the shoulders of those who came before me. Therefore, I will quote freely from other writers. We seek to promote peace and understanding, rather than hate, violence and war. How about you? What do you believe about this issue? Contact us and give us your thoughts. May all of Abraham's descendants become a blessing to the nations, rather than a curse! Watch our new Youtube Video below!